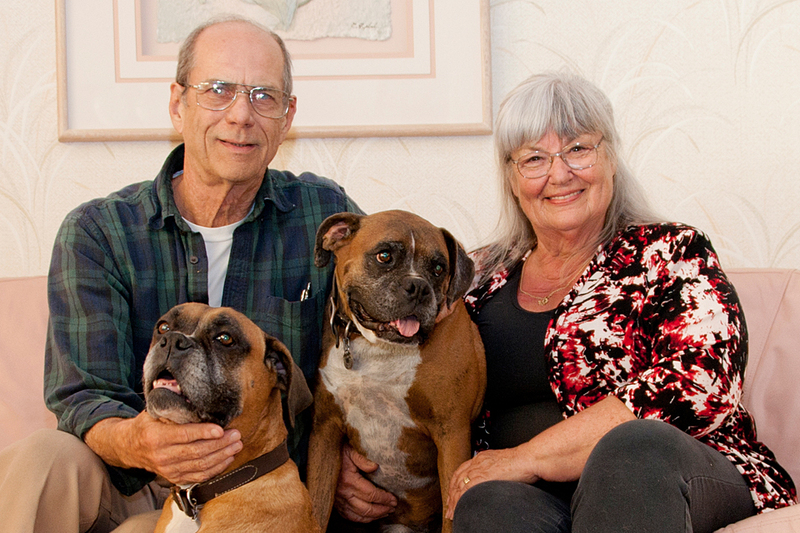 CSUN donors Dr. Richard and Ilona Buratti at home with their beloved boxers, Travis (right) and Phoebe. Photo by Lee Choo. Dr. Richard and Ilona Buratti’s lives were transformed by education. Now, they are transforming education for others with an estimated $750,000 bequest to the California State University, Northridge College of Science and Mathematics. When he was 16, Richard Buratti dropped out of high school, figuring that he’d be set for life with a job that paid $80 a week and a ’50 Mercury convertible in the driveway. He joined the Navy and, after four years in the service, returned home and started working in his father’s pool plastering business. Shortly after the birth of his first child, Richard began to think about going back to school, telling Ilona that if he could do it over, he would have stayed in school and become a doctor or lawyer. Ilona sprung into action, scheduling an appointment for Richard with a high school counselor for the following night. Richard started high school courses that same evening, went on to attend community college, and eventually began a long, successful career as a podiatrist. After buying a local podiatry practice, the family settled in Northridge. Since then, they have considered California State University, Northridge a wonderful neighbor. Their children attended pre-education foreign language classes and the Teenage Drama Workshop on campus. Later, their son attended classes at CSUN, their daughter-in-law earned her master’s degree at the university, and Ilona became involved with the Friends of the CSUN Botanic Garden. “As I got more involved with the university, I got to see what it actually does, and it’s a phenomenal place,” Ilona shared. The Burattis’ first gift was a small bequest to support student scholarships in the College of Science and Mathematics in honor of the teacher who taught Ilona to read. In subsequent discussions with CSUN development professionals, the Burattis realized they could do even more and eventually decided to direct a portion of their estate to support graduate students in the College of Science and Mathematics. Working with CSUN to set up their gift not only provided the Burattis the satisfaction of supporting education, but it also allowed them to make arrangements for their beloved dogs and any future pets. Through gifts to two local rescue groups, the Burattis now have the peace of mind that their animals will be cared for well. Their gift will fund graduate student scholarships and research-related expenses, including travel to conferences. In choosing to support graduate students, the Burattis recognize that graduate students provide valuable teaching and mentoring assistance, enriching undergraduate education and enhancing the overall reputation of the college. For more: Visit CSUN’s Planned Giving website for information on including the university in your estate plan and for other ways to give.